It's Monday morning, and I'm on the road to recovery from Connecticut Sheep, Wool and Fiber. We had a brisk start to the day. It was crisp, clear and dry - perfect festival weather. 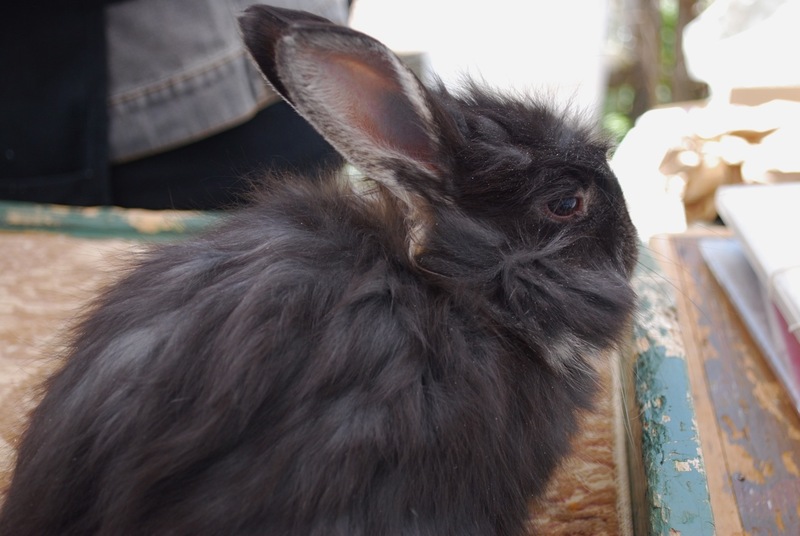 The day included everything from lamb burgers to fried dough. There were sheep dog trials and various demonstrations. These came home with me. Beeswax votives complete with bees. 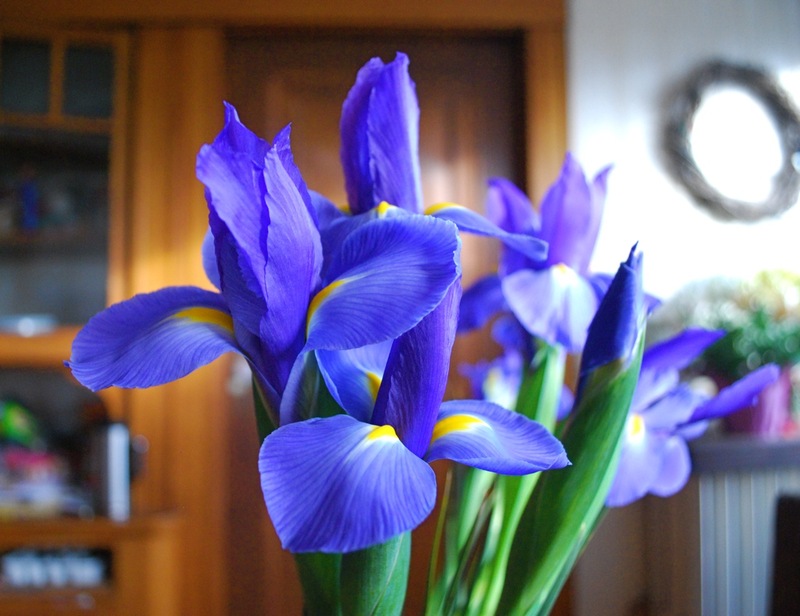 So pretty to look at - I'm not sure I'll be able to burn them. Many thanks to all who stopped by to share their finished projects made with Dirty Water DyeWorks yarn - Catkin (Ravelry link), Dipped Infinity, mitts and more. It's always a pleasure to see so many familiar faces. I'm only sorry I was too busy to take pictures. A day off sounds nice, but there's no time to rest. The next event is right around the corner. Welcome to the Holla Knits Blog Tour. 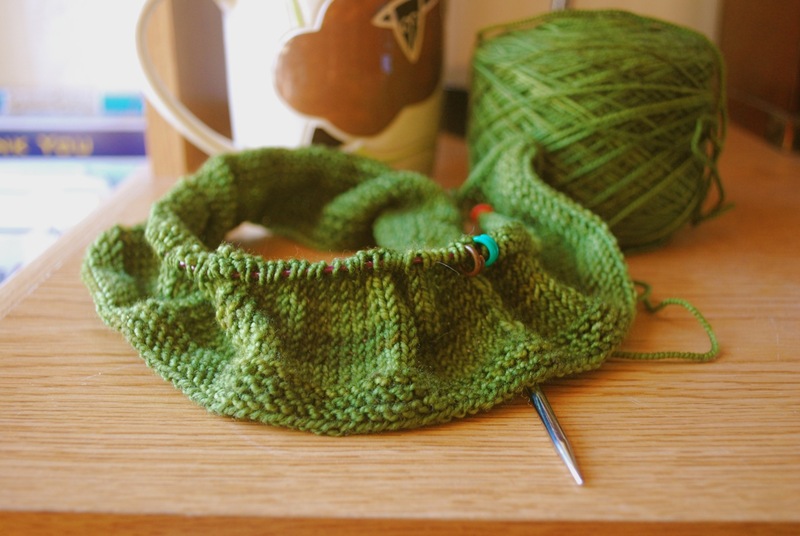 This is day 10 of a tour that has been exploring the designs and yarns used in the Spring/Summer collection of Holla Knits patterns. Allyson Dykhuizen is the driving force behind Holla Knits where she offers fun knitting designs in a range of sizes. My first contact with Allyson was through Twitter. 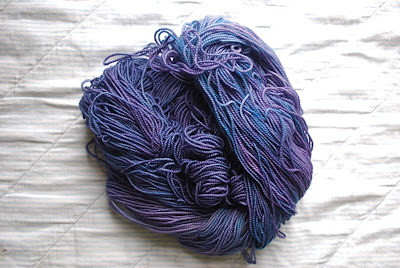 She put out a call to indie dyers in search of yarn support for one of her designs. 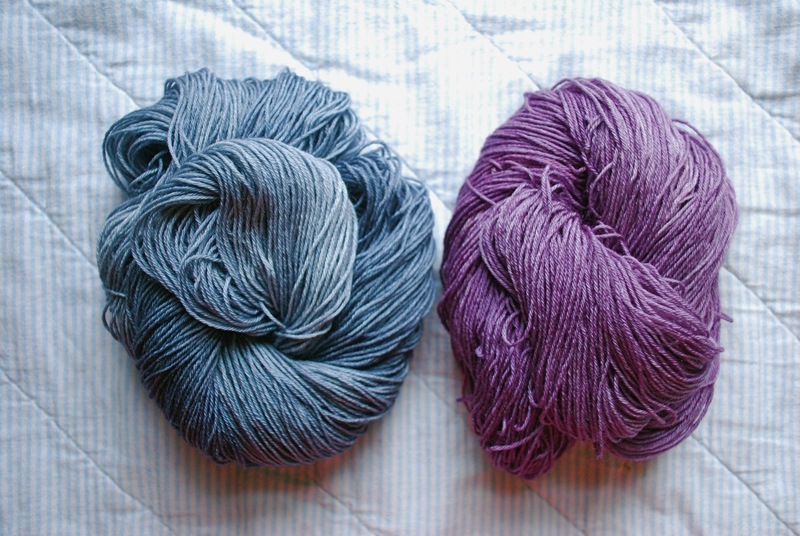 I responded, and we were able to match one of my yarns to her design specs. 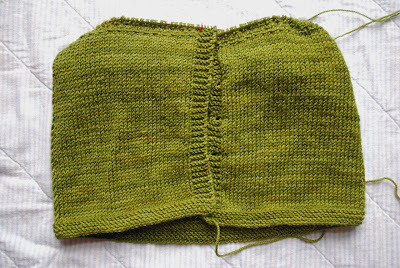 This design was knit with Dirty Water DyeWorks Lucia, colorway Beryl. Lucia is a blend of 75% Superwash Merino and 25% Nylon. 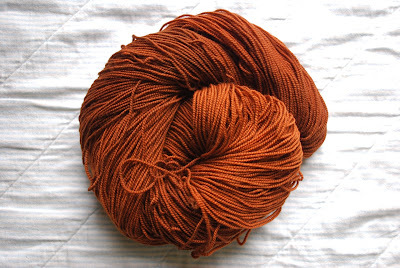 It's a wonderful all-purpose yarn and is good for everything from socks to shawls. 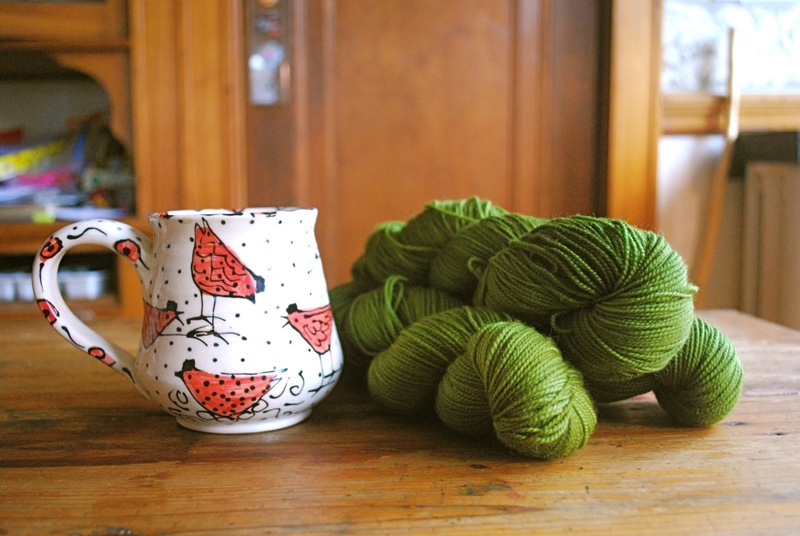 To celebrate Holla Knits and the Blog Tour Dirty Water DyeWorks is offering a special. All orders placed during the Blog Tour will receive free shipping. Simply enter "Holla Knits" in the comments section of the shopping cart, and your shipping charges will be refunded. 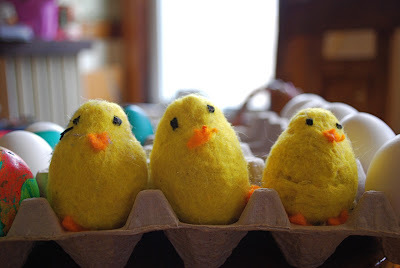 And be sure to check in with the Holla Knits Blog and all the other tour stops for more specials and giveaways. Thanks to Allyson for the opportunity to work on this project. It's been great fun. 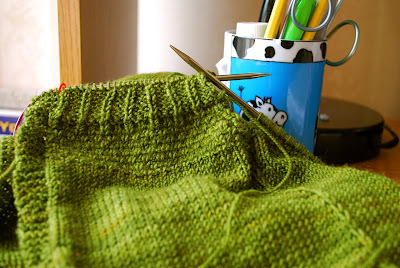 See the list below for all the stops on the Holla Knits Blog Tour. This has been one of those weeks where I've needed some fun color to brighten my days. 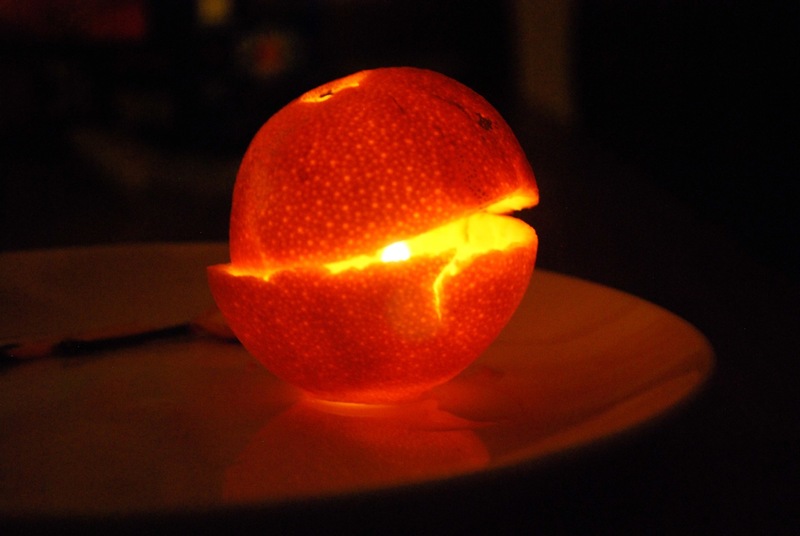 A match and an orange peel did the trick - my color inspiration for the week. A piece of the sun. Every day we make decisions - what to wear, what to eat, what to knit. Sometimes the decisions are easy, and sometimes they are hard. The kit craze continues here at Dirty Water DyeWorks, and recently I picked out beads for a new kit offering. So many options, so many tough decisions. I want to use them all. The Belle Nuit Shawl Kit complete with beads will be available this coming Saturday at Connecticut Sheep, Wool and Fiber Festival. This one day event kicks off the spring round of New England sheep and wool festivals. The location in Vernon, CT is easy to get to and convenient for many. If you're in the area, it makes a great day trip. And now I have to get back to sorting beads . . .
My booth is like a puzzle - a work in progress made up of many different pieces. The display is always changing depending on the venue and my inventory. To add to the fun I like to mix it up by adding new items. I've spent weeks making decisions and selecting colors for new kits and new yarns. Now comes the puzzle part. 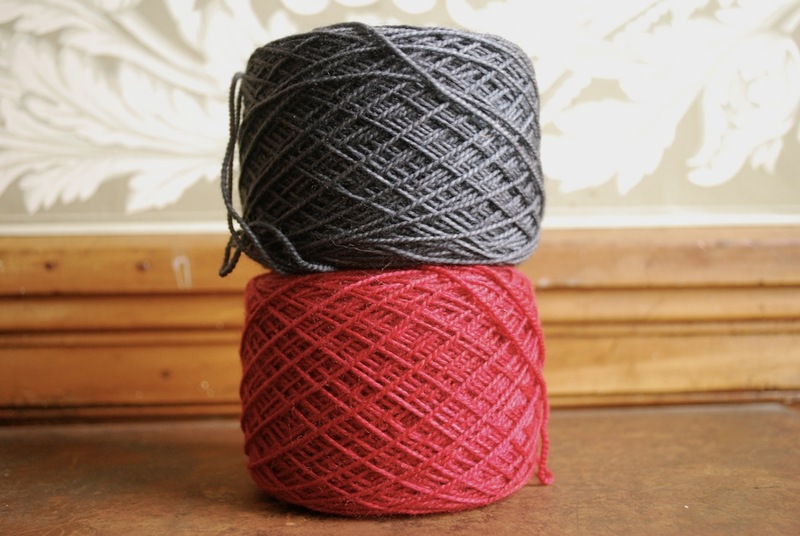 These Mavis color combinations are part of a new kit. The challenge right now is incorporating these new kits into the display. Where will they go? I'll have to play around with the puzzle pieces until I get the right fit. Preparation for the spring shows is moving right along. It involves many lists with a bit of problem solving thrown in for good measure. I always love a good challenge. 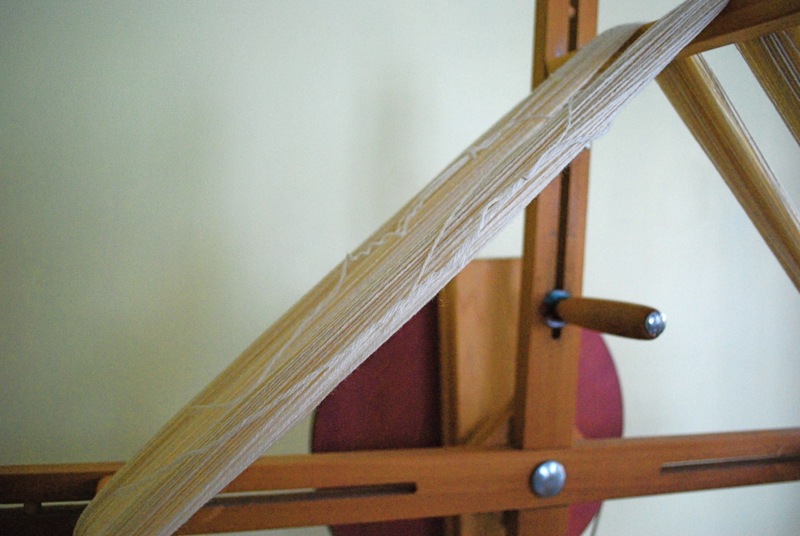 The last couple of days have been spent at the skein winder. Today holds more of the same along with a significant amount of dyeing. I guess I'll have to pass on that little party going on over at Fenway. In other news . . . Dirty Water DyeWorks has expanded its retail base over the last few months. 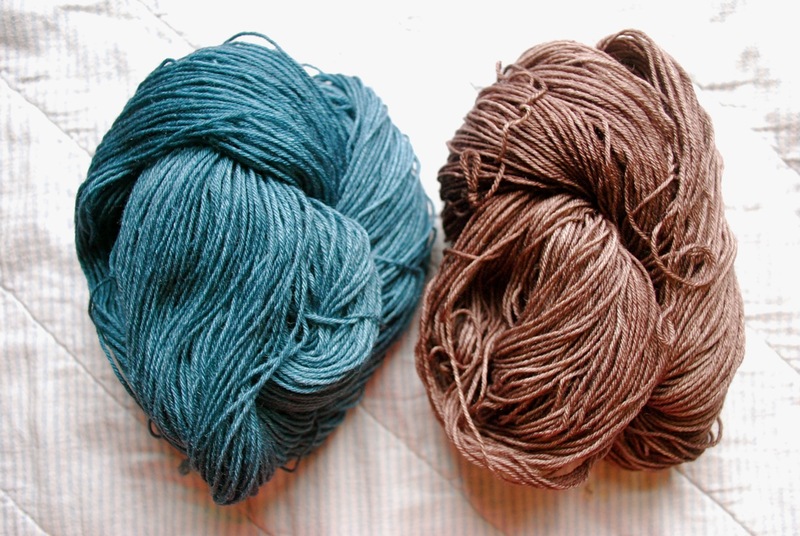 Now in addition to the full lineup of sheep and wool festivals, you can also find Dirty Water DyeWorks at select yarn stores. More will be added so be sure to check back. Dirty Water DyeWorks may be coming to a yarn store near you. 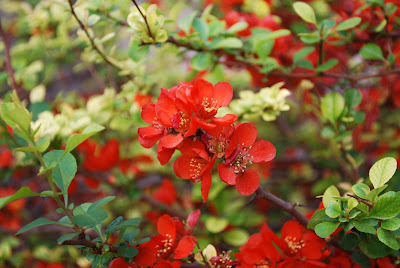 My color inspiration for the week is a blaze of color against a background of fresh greens. Since Monday was a holiday, Tuesday decided to kick me like only a Monday could. I had endless waiting time. Usually I welcome waiting time, but the time I had on my hands yesterday wasn't conducive to knitting. Such a waste. When I wasn't waiting, I was tethered to my computer, putting out virtual fires with a string of emails. I was only too happy to see Tuesday come to an end. When I woke up this morning and surveyed my knitting, I had a sinking feeling. Could it be the bad vibes of Tuesday had spilled over into Wednesday? Yesterday between breaks in the action I had been working on this sleeve. In the morning light I had to admit that the gauge was wonky. It was probably one of those things that wouldn't be noticeable unless I pointed it out. But could I live with it? I contemplated my options, set the sleeve aside and went to pour more coffee. I could carry on as if everything were right on target, knit to the cuff and then decide that I couldn't live with it and rip it all out. Or I could kick this bad karma in the pants, rip it all out now and start fresh. By the time I had re-filled my coffee cup, I knew what I had to do. Today is a new day . . . and a new sleeve. 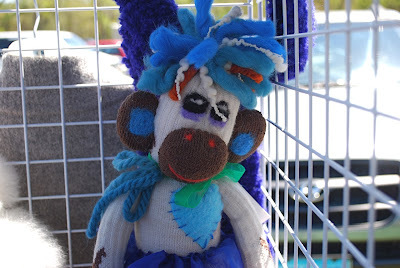 It's Monday morning, and I'm picking up the pieces from another weekend of fiber fun at the Indie Fiber Arts Marketplace sponsored by the Great Rhody Yarn Crawl. The Marketplace was held at Slater Mill, one of my favorite venues. For many it was the last stop on a 3-day yarn crawl. 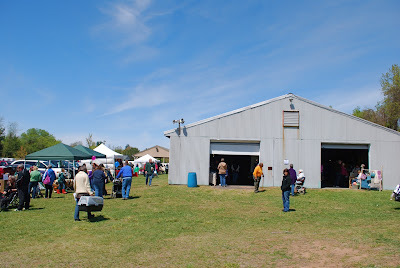 In addition to a nice selection of vendors the Marketplace had more to offer. There was someone on hand to offer knitting help for those who needed it. There was a yarn tasting sponsored by Berroco - a great way to sample some of their yarns. All kinds of goodies for crawlers who entered to win raffle prizes. Alasdair Post-Quinn was on hand to sign copies of his book, Extreme Double-Knitting. 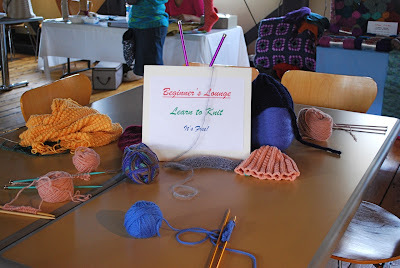 There was also a silent auction of hand knit items to raise money for the Rhode Island Food Bank. And there were knitters just hanging out, doing their thing. 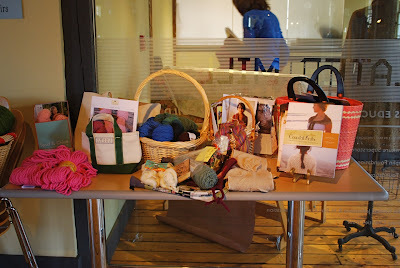 As always it was great to see so many from the Rhode Island fiber community. I'm always inspired by their passion, energy and enthusiasm. Today is Patriot's Day and Marathon Monday - a day off for many here in Massachusetts. I won't be taking the day off, but to celebrate I'm going to treat myself to a bit of focused knitting time. This has been one of those weeks where the days have run together. I inadvertently tried to add time to the week. All day Wednesday I had myself convinced it was still Tuesday. The combination of dye fumes and not enough sleep can do that to a person. I've been working away on this, that and the other thing. I've had long days and busy dye pots. The nice thing about dyeing is that it gives me time to contemplate other projects and plan ahead. All the makings for a new sample - out the door and in the hands of a knitter friend. Colors chosen and balls wound for another new project. Just in case. Always looking ahead while keeping my eyes on the present. If you're in the Rhode Island area, don't forget the Great Rhody Yarn Crawl. The fun starts today and continues all weekend long. The weather forecast is favorable . . . perfect for crawling. 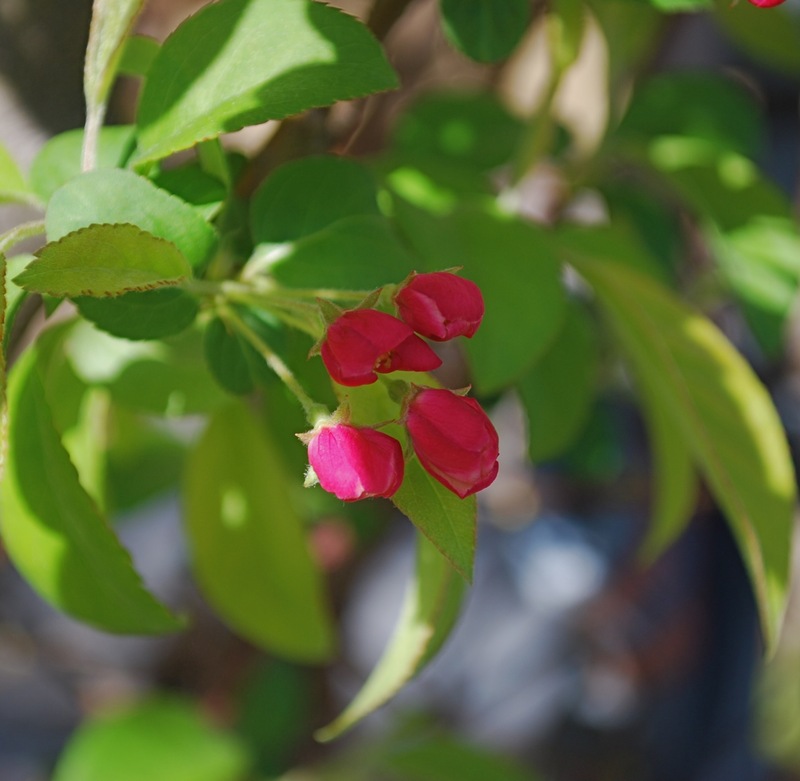 We've had a dry spring, and the color changes seem to be appearing in slow motion. This little spark caught my eye - my color inspiration for the week. 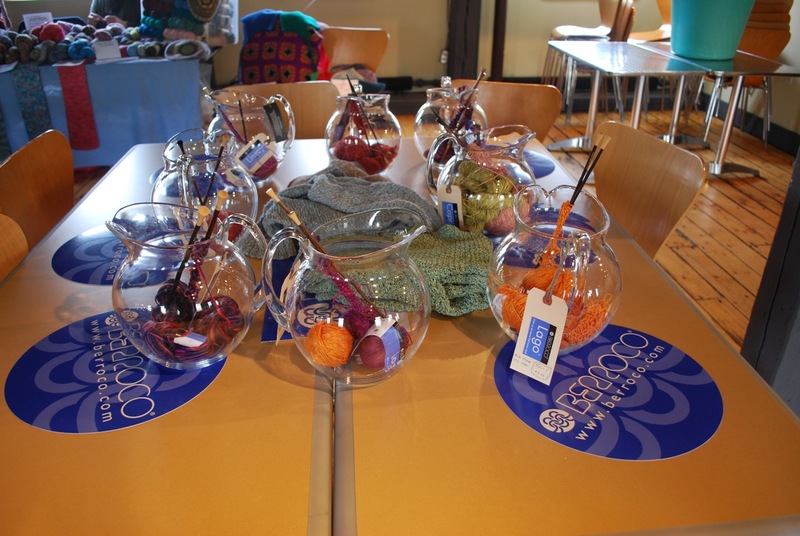 The fiber community in Rhode Island is gearing up for the second annual Great Rhody Yarn Crawl this coming weekend. Over a dozen Rhode Island yarn stores are participating in the Crawl that runs from Friday to Sunday. The weekend includes prizes, raffles and store specials. You can find additional information about each store on Ravelry. The weekend festivities end at Slater Mill on Sunday afternoon where there will be an Indie Fiber Arts Marketplace and culmination ceremony. 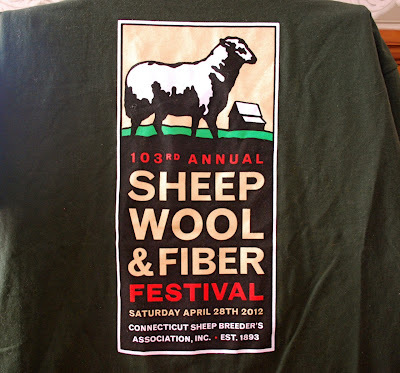 If you're in the area, don't miss out on this weekend of fiber fun. 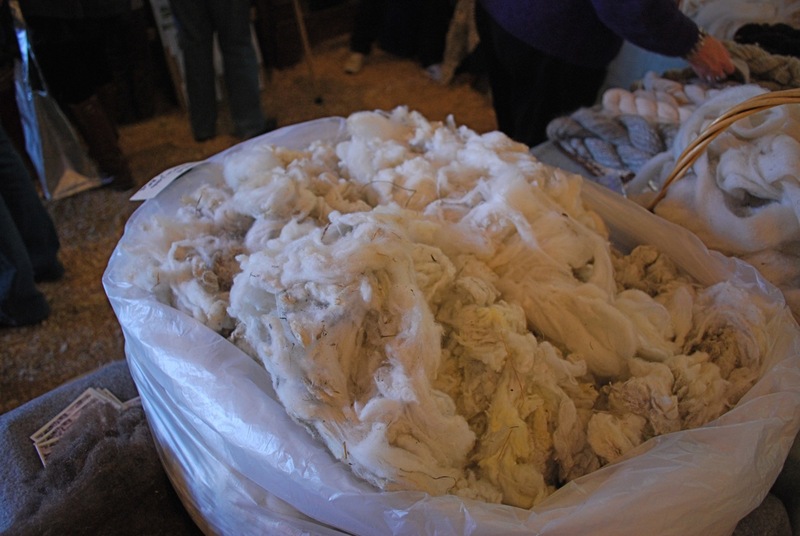 It's a great opportunity to get out and explore some of Rhode Island's yarn stores. Print out your passport and get ready to crawl. Once again the organizers are collecting donations for the Rhode Island Food Bank. Check here for a list of items the food bank needs. Last year the Crawl donated 1100 pounds of food. The goal for this year is 1500 pounds. Donations can be dropped off at the yarn stores or Slater Mill. Dirty Water DyeWorks will be vending at Slater Mill on Sunday. I've been busy getting ready to head to Rhode Island but have squeezed in some knitting time. The wee Austin Hoodie is a tangle of cables and ends right now. The left front and back are finished, and I'm working my way up the right front. After that I'll join the shoulders and whip up the sleeves. It won't be long and I'll be choosing buttons. Every day is a work day for me, but yesterday I gave myself some time off. I didn't take the whole day off. I got my early morning dyeing in before calling it quits for the day. 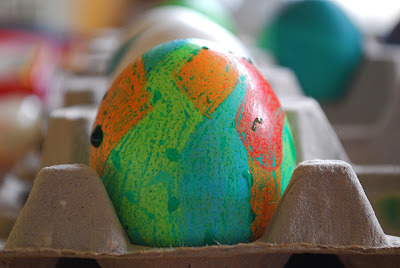 The kids had some dyeing of their own to do. Even though they're teenagers, they still enjoy this springtime ritual. And they put some time and effort into it. 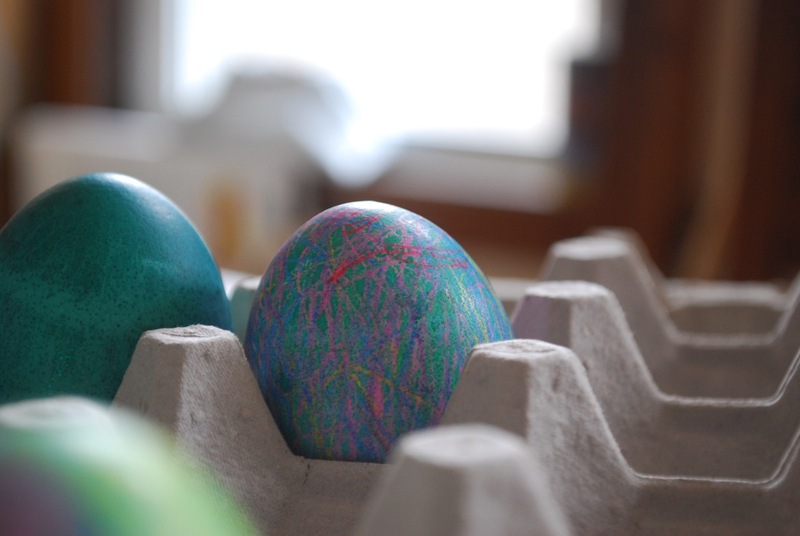 They still enjoy dyeing eggs as much as they did when they were little. 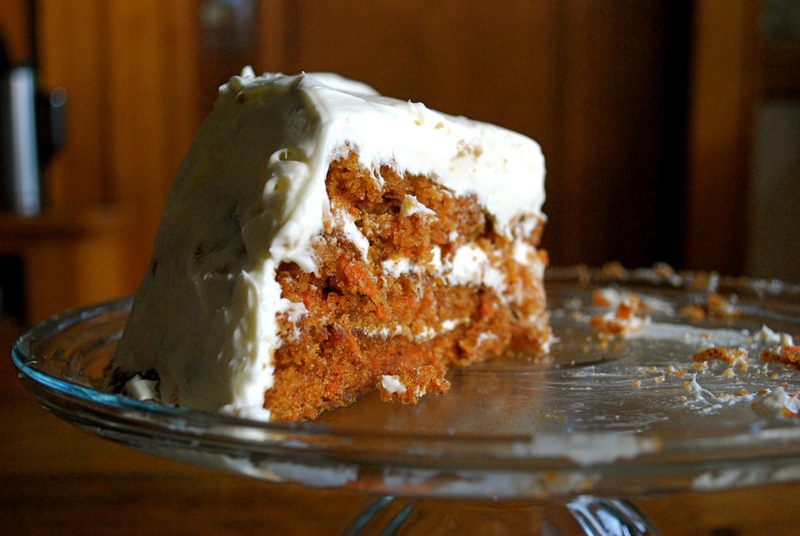 Followed by tea and cake. I'm surprised there was any cake left this morning. And of course there was knitting. Time off for a relaxing afternoon with family and friends . 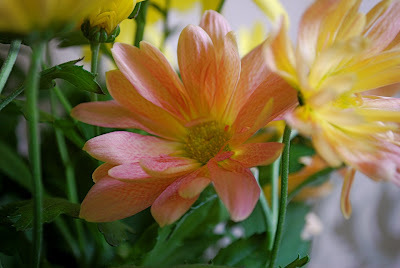 . . a lovely way to celebrate spring. I've happily been working away on my newest knitting project. As so often happens with new projects, I can't put this one down to work on anything else. I'm sure at some point the novelty will wear off, but for now I'm enjoying each and every little stitch. This lovely little bit is the wee Austin Hoodie. I said I would knit only the boring stockinette section and then I would pick up one of my languishing projects. 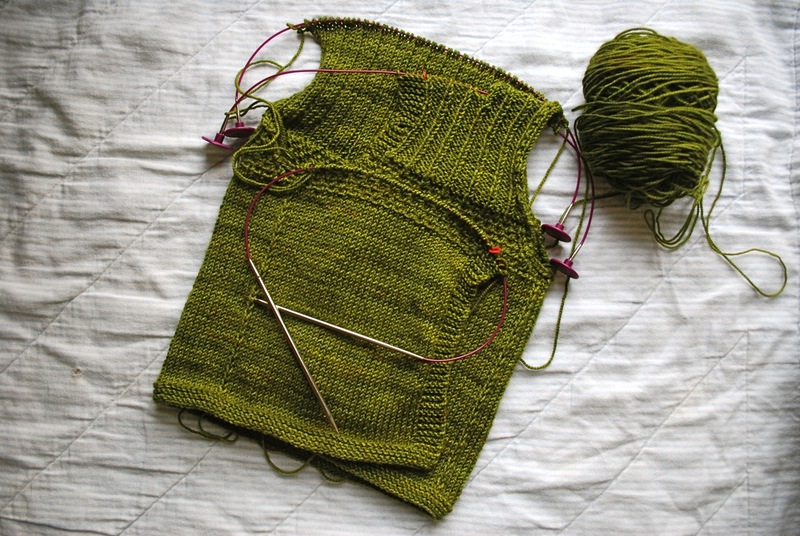 I began knitting the body of the sweater and all too quickly reached the prescribed length. But that wasn't enough - the pattern pulled me in with something different. 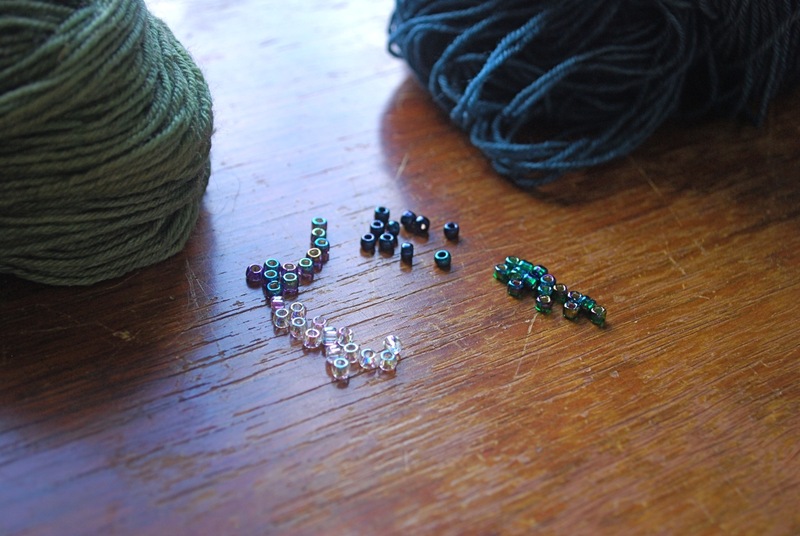 To keep things interesting I've now changed needle sizes and the stitch pattern. You can't see it in this picture, but I've also bound off to divide the sweater into two fronts and the back. In general baby sweaters move right along, being so small and all. 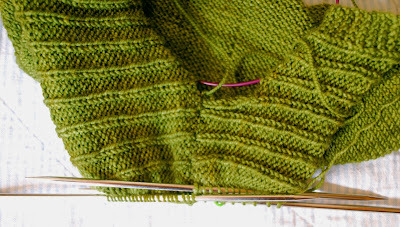 This design incorporates three different stitch patterns and is barreling along at super speed. At this rate there's no telling how far I'll go before I even consider one of my other projects, but it's safe to say I'm not going to stop at the divide. It's not every day that one of my teenagers gifts me with flowers. 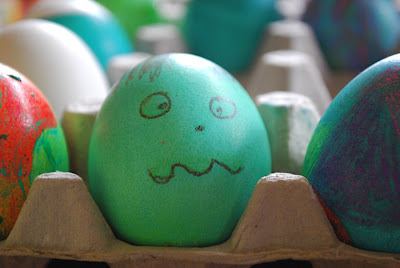 Since the event is so rare, I'm marking the occasion with my color inspiration for the week. I have no qualms about starting a new knitting project even when there are already several works in progress. Sometimes when you've had a rough day, there's nothing like casting on a new project as a pick-me-up. 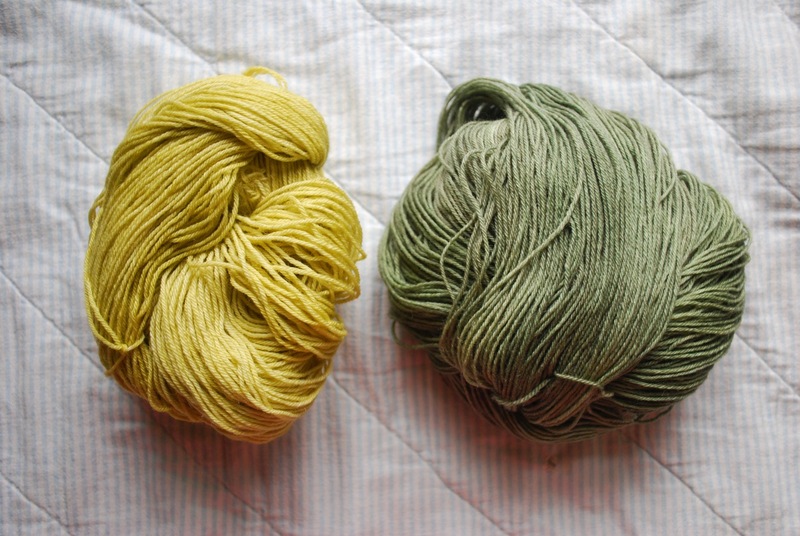 If the yarn is in stash, the cost is low. It's better than destructive, unhealthy stress coping behaviors. I had some freshly dyed yarn designated for a new project and had told myself I would cast on this coming weekend. I'm not sure why I set that timeline for myself - maybe holding onto hope that I would finish some other project in the interim. I do have several things on the needles, and it would be nice to finish a couple of them. It's good to set goals. 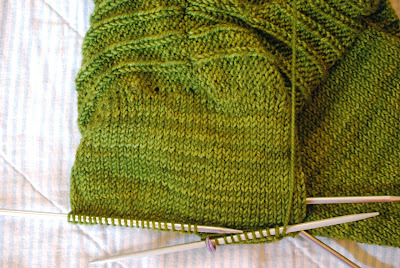 In a roundabout way I was setting one for myself by holding off on the new project for a few days. Yesterday I needed a little boost and decided there was no point in waiting. What difference would a few days make? Life is short. Fresh yarn, new project. Just what I needed. 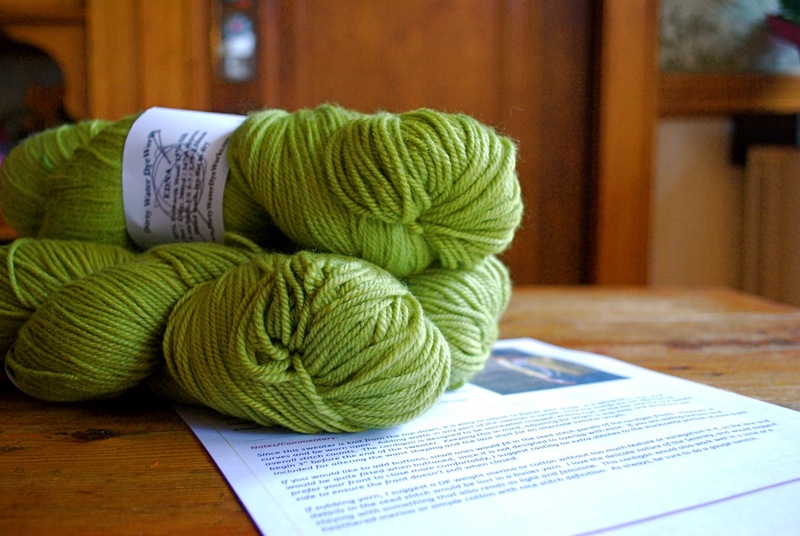 I've spent the winter months planning - new yarns, fresh colorways, fun kits. I've had my eye on the spring events. 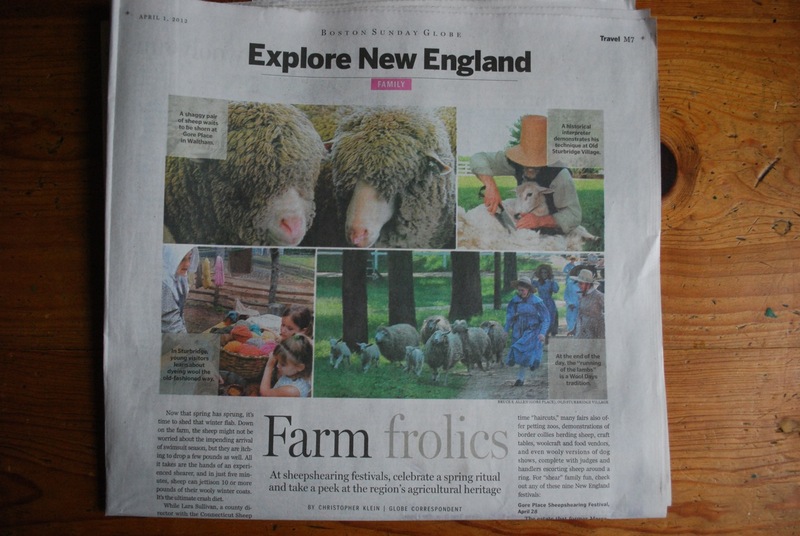 I was organized and on track with my preparations until I saw this article in yesterday's Boston Globe. Those spring shows don't seem so far away now that the Globe is broadcasting the news. 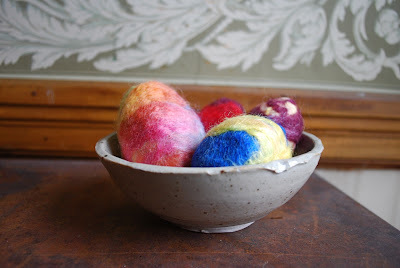 The spring theme was reinforced when my daughter started making her annual felted eggs. She's made them since she was little. Back then water, wool and a bit of soap provided hours and hours of entertainment. I do love these fibery reminders of the season. 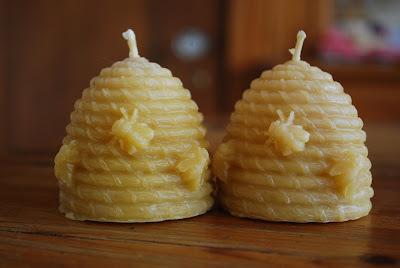 If you're interested, last year I posted step-by-step instructions on how to make them. Over the weekend I did a lot of dyeing. The list was long, but I managed to squeeze in a new kit colorway. 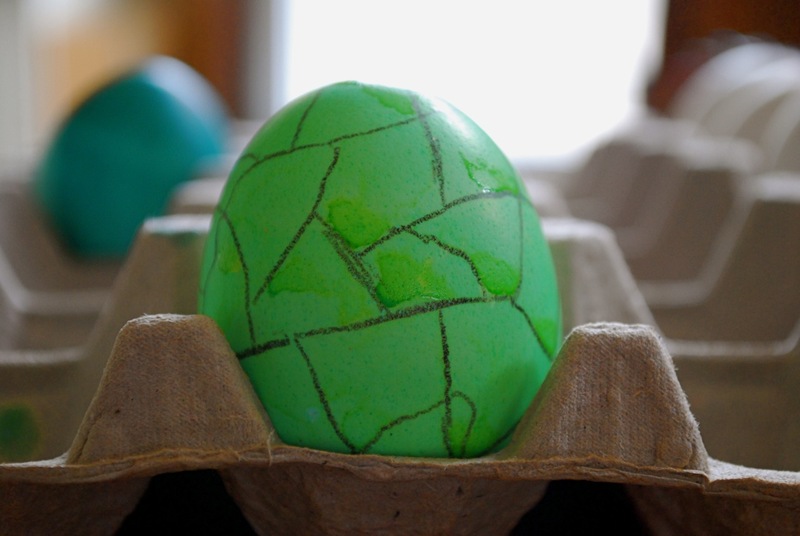 In keeping with the season it's green, of course.